Marbank strives to demonstrate the highest level of professional standards. Registered Office: 3 Napier House, 2 Wintersells Road, Byfleet, Surrey, KT14 7LF. Registered in England, Company Number 2894161. Our insurance renewal date is August 1st. You can view our current Employers’ Liability insurance here. If you require further information, please contact our finance director Steve Brown. 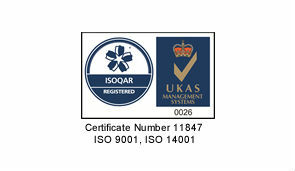 The company’s Environmental Management System (EMS) is accredited to ISO 14001 by UKAS accredited certification body ISOQAR, part of the Alcumus Group. Marbank’s Quality Management System (QMS) is accredited to ISO 9001 by UKAS accredited certification body ISOQAR, part of the Alcumus Group. You can view the entire Quality Policy Statement here.